Nestled in the heart of an elegant residential district of Paris, between Trocadero, the Eiffel Tower and the Arc de Triomphe, you will find this charming hotel, housed in a romantic 19th-century mansion. La Villa Glamour is an atypical 11-room hotel, offering a welcoming and intimate ambience in one of the most beautiful districts of Paris. A boutique hotel is a small structure, nicely decorated and with unique design. The boutique-hotel reveals a new luxury: romantism, a trendy place, privacy, delicate atmosphere, every detail is important. Situation / district: One of the most beautiful and elegant districts of Paris, which is very attractive and nice for quality shopping. 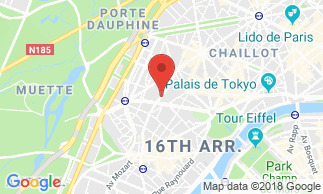 We selected our 'good addresses of the district' in order to make you discover both the most trendy confectoner of Paris, as well as the best Chocolatier elected 'Meilleur Ouvrier de France', and also the largest second-hand shop of luxury vintage items of Paris, very trendy fashion boutique. All 11 rooms are equipped with quality duvets, linens and pillows, large screen TV, safe, WiFi, soundproofing and air conditioning. - Comfort rooms with sizes ranging from 18 to 22 m² (king size bed 180 x 200 cm). These rooms are classified 'comfort rooms' as they have either a whirlpool, or have been transformed into a small independent apartment, or a duplex. - Deluxe rooms with sizes ranging from 24 to 27.5 m² (king size bed 180 x 200 cm) with deluxe shower or Napoleon III style bathtub. Extra bed for an adult : 23 EUR per night. - Private outdoor car park : 32 € / 24 hours. - Private shuttle from and to the airport : 27 € / person. - Our reception staff speaks English, Polish, Arabic and Russian. The hotel is located a five-minute walk from the Trocadero and the Bois de Boulogne Park. A few steps from the Trocadero Gardens and the Eiffel Tower, you will enjoy a most impressive panorama over Paris. Breakfast can be served in your room, from 7:30 am to 10:30 am. In case of arrival outside these hours, you can access the hotel with a code. Hotel Villa Glamour Tour Eiffel Beautiful hotel, ideally located! Our room was very "glamorous", very comfortable, very "cocooning". Hearty breakfast, and very friendly service. Ideal for a romantic getaway to Paris.